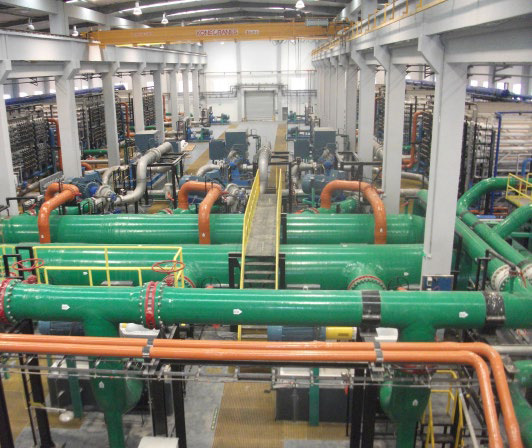 China’s Qingdao SWRO Desalination Plant went online in June 2012 to provide 100,000 m3 of drinking water per day to the 500,000 person City of Qingdao. The plant was developed by a joint venture between Abengoa and the Municipality of Qingdao and is one of the many seawater desalination initiatives in the country that supply water for residential and industrial use. Investment for the plant reached $176 million and is the largest of its kind in China. 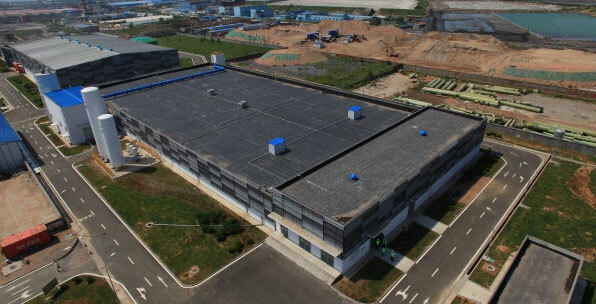 Qingdao Water Group is the current owner of the plant. The Qingdao plant uses water from the Jiaozhou Gulf. Intake pumps bring water from the Gulf for pretreatment with a 250,000 m3 per day Norit ultra-filtration membrane system. There are three high pressure pumps to supply a total of six reverse osmosis membrane trains each with its own energy recovery systems. The reverse osmosis configuration is a 2 pass system with an elevated pH on the 2nd pass for boron removal. Two years of pilot testing helped optimize the feed flow design of 232,000 m3/day in the winter at 3 oC and 235,000 m3/day during the summer at 21 oC. Raw water from the Jiaozhou Gulf was analyzed using PWT’s ProDose scale prediction software, and showed both BaSO4 and Fe3+ above their saturation levels, and would require an effective treatment to avoid scaling issues within the plant. The raw water data (Figure 1) also indicated the levels of strontium, calcium, and silica foulants presented lesser concerns at expected system recovery levels. The plant design also faced challenges from the fluctuating turbidity, temperature levels that reached as low as 1.3 oC in the winter, and other considerations with the raw water source. PWT recommended their phosphate-free antiscalant Titan ASD 200 for the Qingdao plant to control fouling and reduce membrane cleaning requirements. The suggested dosage for the 1st pass was 1.7 ppm to inhibit CaCO3 and BaSO4 scaling. The 2nd pass dosage was higher at 2.5 ppm to prevent MgOH scaling. Dendrimer-based Titan ASD™ 200 presents no compatibility concerns for the RO membranes, and is an environmentally sound alternative to traditional antiscalants. As part of their services to the Qingdao plant, PWT also provides comprehensive feed water analysis every quarter and advise the customer on adjustments to Titan ASD™ 200 dosing when necessary. While overdosing is a minimal concern because Titan ASD™ 200 will not precipitate or bind to membranes at high concentrations, PWT makes on-site training a priority. Qingdao staff received training for dosing and system cleanout processes including pretreatment chemicals and the cleaning of the UF, RO, cartridge filters, tank, and piping. Cost audits were completed on the pump, membrane, and cleaning. PWT staff also conduct monthly site visits to complete a system check, record data and complete a system analysis. Qingdao staff have access to the PWT experts 24/7 online or via phone. If necessary, the local PWT team can be on-site within 12 hours. As seen in Figure 2, the plant was able to keep both BaSO4 and Fe3+ below saturation at a recovery rate of 45%. Figure 3 shows that BaSO4 was super saturated prior to treatment, and 12.5% of saturation after the use of Titan ASD™ 200. Raw water concentrations of Fe3+ were reduced to 8.5% of saturtion when treated.